I believe mothers are angels, who look after God’s children. Being a mom is not something you can be hundred percent prepared for .Even if it’s your second child, there will be surprises . There are certain favourite baby stuff ,which make life easier. 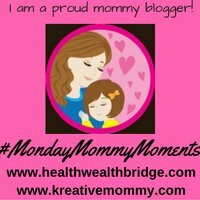 Today is my first day as a cohost for #MondayMommyMoments ,with the very talented creative mommy Deepa. With Christmas round the corner ,we are discussing ,our absolute favourite Baby products.If you haven’t got what you need ,this is the right time to make your wish list.Who better to help ,than other mommies? My daughter has outgrown most of these but writing about them helped relive ,those lovely memories. Mamy pokopants these pant style diapers, were my favourite. Once my daughter was toilet trained, we stopped using them. The amount of pooping and peeing that baby’s do ,a great diaper ,which is easy to put on and comfortable for the baby, is a must have. I don’t go anywhere without wipes.Children have a habit of getting their hands dirty anywhere. Wipes help to quickly clean my hands and her hands when I need to feed her. Then just give your hand a quick rinse with water ,to get rid of the residues. Baby’s learn to enjoy food by touching and playing with them. It’s a good idea to teach them to hold food and feed themselves. Only problem is the mess . The floor mess and the baby mess. Somehow these bibs made life easier. They are super cute ,easy to put on and can be cleaned quickly. It’s the most important thing to have for small families with little help . The baby monitor helps keep an eye on the baby when you are busy in the kitchen or some other housework. We shifted home when my daughter was 10 months old just learning to crawl. If not for this cot, gifted by my sister ,it would be impossible for me to go to the bathroom. The only way she didn’t scream ,was when I kept the door open and she could see me from her cot. Lifesaver!All mommies have had atleast one such impossible moment ,when you realize ,life is never going to be the same again. These are pretty ,durable ,easy to clean ,microwaveable and safe. Plus you can replace teats if your baby bites through them. First gifted by a dear friend it’s a must if you bottle feed after weaning. Since I was working this was a much needed. Rai was in it for about one and a half years .Then she refused. But even then the price was worth it. A must have if you love travelling as much as we did. This week is special .I am starting # with Deepa. Being a mommy is the only thing in my life I didn’t research about. Luckily my daughter is less trouble than I am ,so we have a good time together. She is going to be 5 in February and is easily my sweetest friend. Being a friend is easy .But being a parent a mommy is difficult. Playing is easy .Discipline is hard. When you see tears in those sparkly eyes ,the only thing you want to do is kiss them away. But teaching good habits ,helping them choose right from wrong ,truth and lies start from this age. If the framework is good life is a breeze. Monday mommy moments are the precious moments which has made you an awesome mommy. Our last week’s winner for #MMM is Zainab. We are so happy to hear all her stories . Baby products are so cute, thy hold the memories of the child growing up stage by stage. True! Bibs are very useful Amrita. It’s interesting to shop for them as we get too cute ones. Baby cot is so helpful in instilling habits of independence in our child. Your blog reminded the favourite hub of my kids-their cot. Thankyou, Amrita & Deepa for liking my last post! As you will read, I’m a big fan of the baby monitor. It’s rather handy. I just wish I had the one with the camera! I didn’t use these mamy moko pants, but I wish I did! These are all great products Amrita. I loved baby monitor and baby bag.Diaper bag was very convenient while going out with my kids. And writing all this surely made us nostalgic. As the girls are grown up now, I miss those days. 🙂 Its great co hosting it with you Amrita. Thanks for co hosting with me.